After taking inspiration from some of the gorgeous images in our week 1 post, this is the mood board that came about. Though it may look a little LOT bananas all squished together on one little square like this, once it is all spread out in the Butter Bear’s room, it shall be black and white big boy heaven. We’re a little behind, so it’s time to get our plan firmly in place, and this upcoming week we will start getting down to business. 1. Paint – White, white, and more white. Enchanted kingdom be gone! Right now I’m thinking Sherwin Williams Pure White in eggshell. 2. Chalkboard paint – cover the tallest wall in the room (above the crib) with black chalkboard. The ceilings are 11 feet tall, so I’m looking forward to it being an ever-changing canvas of creativity. Mostly for Htown and myself. 3. 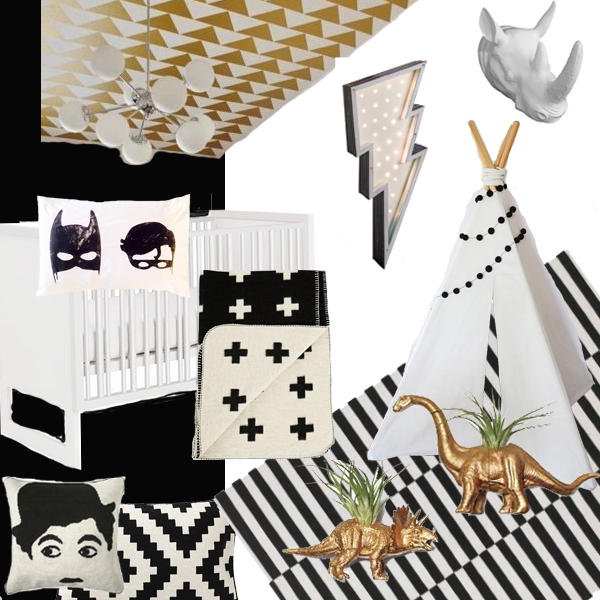 Ceiling – after crushing on the nursery in our week 1 post, I decided Butter’s ceiling needs to have a HUGE impact. Considering using these same triangle decals (pictured above). 6. Book shelves – in nook behind door all the way up to the ceiling. Hooks at the bottom for hats or jackets. 7. Teepee – So I really want one, but these bad boys are expensive. Then I discovered the magic of Tip Top Teepee Shop. If you purchase one of their teepees, and have them professionally photographed in your adorable space, they will credit your purchase in return for using the photos on your website. Yessss. 8. New pillow/throw for chair – would love to pull in some of my faves from Jonathan Adler. This pillow is a must, and this throw might be perfection too. 10. New rug – something inexpensive that I won’t cry about when potty training happens…like…on it. This bad boy from ikea is first on the list. Lots of ordering and prep work to do! By the time I check in with you next week, hopefully much more of this will be underway. Stay tuned! And be sure to check out all of the other participants week 2 updates at Calling it Home! Manor Launch Party April 9th!!! This room is gonna be so graphic modern adorable. Love it. Book yourself a massage for after the ceiling decal application!